This living room is so spacious that no one can blame for lack of space. The room size is good enough o move about witout any obstruction in between. In fact all the furnitures and fixtures of this room are of the most appropriate size that everyone actually dreams to have. 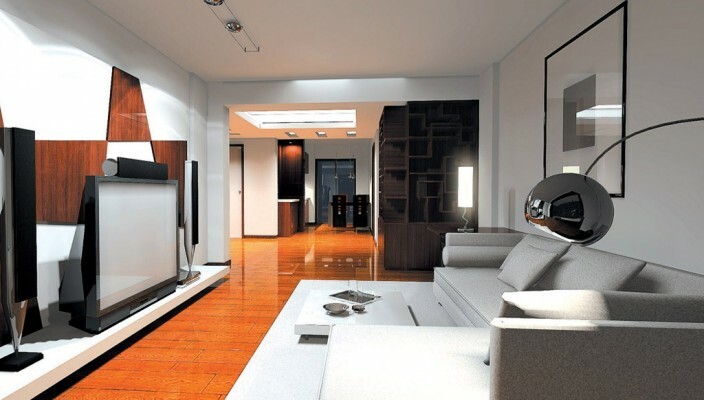 This living room is inspired with high and creative thinking of the designer and is best suited for those who think big. Talking about the color compostion and choice of furniture the room marks a perfect mixture of wood and basic white color. The home theatre set and the sofa set are placed in a perfect location for better relaxation and comfort. The wooden open book rack is amazing in its design and that too has multiple utility. The rug and scenery match with each other. The wooden colors have been perfectly matched up with black and white combinations.